If ever there was a game Annan could look back on with some regret at the end of the season, then it could most definitely be this match. Annan should have been out of site at half time but instead they went in goal less and were left to rue the missed opportunities as Stirling secured a point with a 60th minute Sean Dickson penalty canceling out Smart Osadolor’s 46th minute opener at the start of the second half. Annan started the game with Sloan returning to the midfield at the expense of Ryan McStay and Rabine Omar giving a starting slot at the expense of Stuart McClom, following his sending off against Queen of the South in the League Cup. The pattern of the first half was set early on with Smart Osalodor forcing Kevin McKinlay to conceed a free kick wide on the right, the resulting Omar free kick was defended, minutes later Osadolor picked out Peter Weatherson who failed to control the ball and a good scoring opportunity was squandered. Minutes later Josh Todd who had a quiet game by his standards, turned neatly on the edge of the box finishing with a low shot which flashed past the keepers left hand post. Stirling forced a couple of corners which came to nothing and Rabine Omar skied over the bar when he cut in from the right. Sean Dickson relieved the pressure for Stirling when his shot went narrowly over the bar following a mix up with the original free kick. With 20 minutes gone Phil Johnston’s near post cross was narrowly headed past by Dickson. It was a rare moment of anguish for Annan. Weatherson should have put Annan ahead in the 25th minute when Omar’s free kick fell invitingly for the Annan striker who’s effort from close range was deflected for a corner kick and from the resulting corner Watson’s effort was deflected for another corner from which Weatherson headed over the bar. Weatherson’s normally prolific touch once again deserted him in the 32nd minute when Osalodor whipped in a great ball and from 3 yards Weatherson will know he should have done better than half hit the shot. 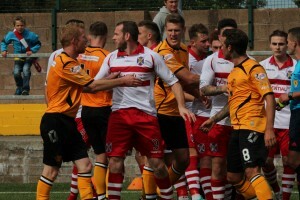 Annan had claims for a penalty turned away when the ball struck Craig Comries hand and from the resulting corner Peter Watson struck the ball past the post from a great position. Annan continued to press forward till the break with Flynn coming close when he was picked out by Osalodor. Annan started the second half in the same manner and within 40 seconds they went ahead, when Osadolor made the most of hesitancy in the Stirling defence finishing with a vicious shot from an acute angle. Todd was unlucky not to double Annan’s lead when he failed to connect with Omar’s low cross with the goal gaping. Stirling were being torn apart and in the 51st minute Weatherson set Todd up but uncharacteristically Todd squandered the opportunity and Stirling breathed again. Then the match appeared to turn in the favour of Stirling after Steven Sloan fouled Craig Beattie in the box and from the resulting corner Sean Dickson stroked the ball low into Hart’s left hand side to square the match. It appeared to be a harsh decision but the referee was well placed to award the decision . The match then took another twist when Kevin McKinley was sent off for a 2 footed off the ground lunge on Rabine Omar. The decision for whatever reason appeared to anger the Stirling team who suggested that Omar had conned the referee, who again was well placed to make his decision and Stirling’s assistant manager was also sent packing for what appeared to be comments made to the officials. Strangely for whatever reason after this it was Stirling who started to look the more composed team but without really penetrating a resolute Annan defence. Jon Paul McGovern came close in the 61st minute when his 30 yard free kick went narrowly over the bar. Annan forced several consecutive corners which were all well defended. Osodalor who was a threat throughout the game came close when his well struck shot flashed past the upright in the 73rd minute. Stuart McColm was introduced in the 75th minute and within minutes he had lofted the ball over the bar . The action continued and in the 80th minute Peter Watson gave referee Nick Walsh no option but to send him packing when he kicked out at one of the Stirling attackers. The resulting free kick was defended. Matty Flynn came close in the 85th minute with a well struck shot which went narrowly over the bar. Stirling will no doubt be the happier of the two teams having secured a share of the points in a game Annan will look back on with some regret. It was a busy afternoon for the officials who appeared to get all the big decisions correctly. Annan will be forced to make changes for Tuesdays Petrofac training cup match against St Mirren with Watson’s sending off resulting in an automatic 2 match suspension. ANNAN ATHLETIC: Jordan Hart, Steven Black, Steven Swinglehurst, Martin McNiff, Peter Watson, Steven Sloan ( Stuart McColm 75 min ),Rabin Omar (Liam Park 86 min), Mathew Flynn , Peter Weatherson, Josh Todd , Smart Osadolor. SUBS NOT USED: Blair Currie, Ryan McStay, Jamie Watson, Greg Macdonald, Scott Norman. STITLING ALBION :Smith Wallace, Lee Hamilton, Kevin McKinlay, William Robertson, Ross McGeachie, Ross McMillan, Phil Johnston (Steven Doris 80 min), Craig Comrie, Craig Beattie ( Ross Forsyth 60 min), Jon Paul McGovern, Sean Dickson( Conor McKenzie 86 min) . SUBS NOT USED: Ross Smith, Sandy Cunningham, Cammy Binnie GK, Salim Kouider-Aissa.